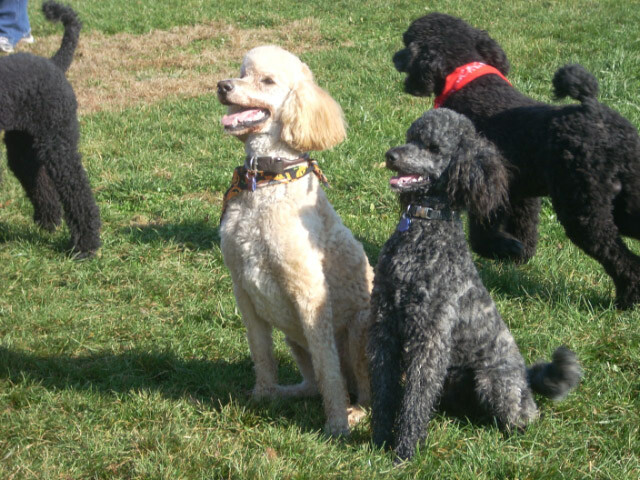 Poodle Blogger: Poodles Behaving at the Dog Park! Just as I was posting the "mid-air" photos of Jeanne's Poodle group at the dog park, she was sending me this photo taken today at the park. The dark brindle pup is Jeanne's boy "Cole". "Here is a photo of an intense Cole and his friend, Beamish, who also loves to chase tennis balls. My friend, Dorothy (whom Beamish owns) makes them sit before she sends a tennis ball flying from the "chuckit." Usually, Cole will sit and then start to scoot backwards to get a head start, but this time I caught him being good! We had 16 Poos this morning. Life is good with a Poo! You are so right Jeanne, life is good with a Poo! 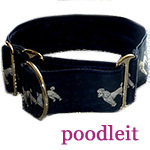 Sure wish we had a well run dog park in our area, with a dozen or two Poodles who could meet every week---what fun! And what a testament to the breed in general, that they can have regular play dates with dozens getting along so well together!